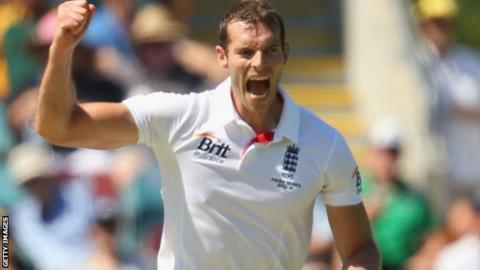 Former England fast bowler Chris Tremlett has announced his retirement from all forms of cricket. The 33-year-old made a total of 12 Test appearances and played a vital role in the 2010-11 Ashes victory in Australia. "After 16 enjoyable years I feel that now is the right moment to call time on my playing career," the Surrey player wrote on Twitter. "Unfortunately injury has hampered me throughout my career and now plays the leading role in my decision to retire." Tremlett has been affected by back and knee injuries in recent years and has been restricted to three Championship appearances for Surrey this season. "My body, and back in particular, can no longer withstand the vigour of performing at the level required to play professional cricket," he said. "After taking specialist advice this latest injury means that I will not be able to carry on. "I have always tried to give 100% commitment and effort whenever I have played but no longer feel that this is possible." Southampton-born Tremlett, who began his career at Hampshire before moving to Surrey in 2010, took 53 wickets at an average of 27 in his 12 Test appearances for England. The most significant, however, were the 17 in three matches as England won the Ashes in Australia in January 2011. He also played 15 one-day internationals and one Twenty20 match for England, with his last appearance for the national team coming in the first Test against Australia in November 2013. "Wearing the Three Lions was the pinnacle and I enjoyed every minute of the challenge, experience and ultimately the success that the team had," he added. "I have been extremely fortunate to have enjoyed such a fantastic and memorable career and lucky enough to play with and against some of the best players in the world."